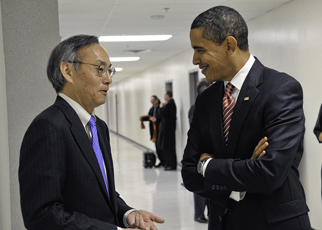 As Secretary of Energy (and former head honcho of Lawrence Berkeley National Lab) Steven Chu continues to find ways to save the world, we like to keep an eye on what the secretary is doing. And just today, the US Department of Energy announced the “first round of funding” that $1.4 billion will go to for the capture of carbon to be stored or used. If asked whether the Berkeley-Stanford rivalry reached to the highest levels of government, most people would probably answer “no.” And they’d probably be right. But it’s at least a little interesting to note that Steven Chu (secretary of energy and former big cheese of Lawrence Berkeley National Lab) and current Stanford professor Mark Jacobson point in different directions for the future of biofuels.